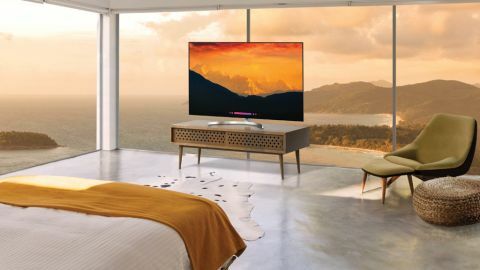 Boasting a wealth of new and impressive features, including Full Array Local Dimming and AI-assistant functionality, LG's SK85 Super UHD TVs offer an affordable alternative to the company's remarkable-yet-pricey OLED range. Released alongside LG's truly impressive 2018 OLED TV lineup, it'd be easy to overlook the company's new 'Super UHD' sister range. But while these LED models may lack their bigger siblings' more-expensive organic light-emitting diodes, they still exhibit many of the same futuristic features. Backed by LG's ThinQ artificial-intelligence (AI) technology, the LG SK85 Super UHD TV feels cutting edge in its implementation of AI, making it one of the smartest smart TVs we've tested. Combined with the television's built-in Google Assistant functionality, the ThinQ platform helps to streamline the TV viewing experience, performing such tasks as switching picture modes on its own, or providing you with an expanded range of voice commands. That's all very impressive, but when it comes down to it, picture and sound quality remain the most important aspects to consider when purchasing a new 4K television. Thankfully, the inclusion of Full Array Local Dimming, nano cell technology and support for HDR10, Dolby Vision and Dolby Atmos means that LG's 2018 Super UHD range is ready to deliver the goods in the audio visual department. For the purposes of this review, we were able to test the 65-inch SK85, but there's also a more affordable 55-inch model available. The 65-inch model (known as the 65SK9000PUA in the US) is priced at $2,199 (£2,499 / AU$4,799), while the 55-inch model (known as the 55SK9000PUA in the US) is priced at $1,499 (£1,699 / AU$3,099). From front on, the LG SK85 Super UHD presents a striking, minimalist visage that, at first glance, seems to eschew bezels entirely from its design — they're there, but you'll need to squint to see them. While switched off, all that's visible is a sleek black rectangle with an austere metal stand — and it's a design whose appearance is even more restrained when the SK85 is wall-mounted. In profile, you may notice that the LG SK85 isn't quite as slim some other LED-LCD televisions on the market and at its thickest point, it's 62.5mm. There's a good reason for that though: the extra width is there to accomodate the SK85's Full Array Local Dimming (FALD) system, which employs hundreds of tiny backlights across the entire panel, rather than the edge-lit backlighting systems that many other TVs implement. This FALD system allows the SK85 to be much more precise with its backlighting, making it possible to light small individual sections of the panel while minimizing backlight bleed — we'll look a bit deeper into this technology in the Performance section below. On the rear of the television, you’ll find a nifty brushed-metal finish, plus four HDMI ports, three USB 2.0 ports, component/composite inputs, a digital optical audio output, a 3.5mm headphone jack, an Ethernet port and an RF antenna port. Like the front, the LG SK85's rear is quite spartan, which helps to keep the back of the set neat, if not quite to the extent of Samsung's Q9F QLED television, which displays only a single all-purpose cable from its chassis. Design TL;DR: The LG SK85 Super UHD bears a minimalist design that exudes sophistication. Its slim bezels and sturdy one-piece metal stand go to great lengths to keep things simple in your living room. It's not the thinnest TV around, but the inclusion of Full Array Local Dimming backlighting at least puts that extra thickness to good use. With its reliance on LG's Magic Remote, which prompts users to point at the screen in a Wiimote-like fashion, the webOS smart TV platform can be an acquired taste, requiring a bit more attention and precision to be paid when selecting a function or menu item. That said, with its implementation on the LG SK85 Super UHD, webOS has finally started to win over this reviewer thanks to a refined presentation that feels intuitive and perfectly suited to LG's unique point-and-click control mechanic. Hitting the 'home' button on your remote will bring up the webOS launcher, which sits at the bottom of the display and cleverly lets you cycle through the TV's various inputs and installed apps without having to leave what you're currently watching. Hovering over an individual blade will bring that app to the forefront, filling the screen with attractive graphics that solidify webOS as the most visually-arresting platform currently available for smart TVs. And, if you want to cut down on all the remote waggling, you can also assign your favorite apps to the 1-9 buttons on the Magic Remote, allowing you to quickly launch your most frequently used functions with the push of a button. Speaking of visually-arresting features, LG's 2018 Super UHD range has brought over the popular Gallery Mode from the company's OLED TVs, giving users the option to cycle famous artworks on the display when you're not actively watching something. When it comes to controls though, it's really LG's AI-backed ThinQ functionality that will have users talking in 2018 — and we mean that literally. Combined with Google Assistant voice control functionality, it's possible to use many of the SK85 Super UHD's functions by speech alone. Asking the television what the weather will be like next week is one thing, but we love being able to hand out more casual commands — saying "show me something to watch" or "I'm bored" will automatically launch YouTube and start playing popular videos, for instance. In our review materials, we were given a huge list of voice commands which we tested at random. To our surprise, the SK85 Super UHD was able to make out what we were saying the vast majority of the time without any specific setup. This includes commands such as "What's the latest TV series? ", which brought us to Netflix's newest additions, and "volume up" to crank up the noise. And, if you're the type of person who regularly plants themselves on the couch for multi-hour binge-watching marathons, you can pre-emptively encourage yourself to get up and move around a bit by asking the TV to "turn off after this program ends." We're told that the aim for LG ThinQ is to learn what you like over time — something that will eventually provide added convenience by predicting your needs. Unfortunately, that isn't something we were able to put to the test in our limited time with a LG SK85 Super UHD test unit. Smart TV TL;DR: LG's webOS platform continues to get better with every iteration, though its reliance on the Magic Remote's point-and-click control method may irk some. That said, we really dig the TV's ThinQ and Google Assistant voice functionality, the inclusion of which makes the SK85 feel like a futuristic device. Having tested a number of Full HD TV shows, movies and videos on the LG SK85 Super UHD via Netflix and YouTube, we found performance to be exemplary across the board. We kicked things off with a bit of animation by watching The Simpsons Movie, which looks utterly fantastic on this telly. Lines were incredibly sharp with very little instances of noticeable aliasing, and colors popped from the screen with immense vibrance. Likewise, watching the opening of Guardians of the Galaxy Vol. 2 in 1080p proved a great demonstration of the SK85's SDR color accuracy, appearing vivid and bright even without any high dynamic range tinkering. It also appeared clean and high in detail, often appearing close to Ultra HD. That said, some visible instances of very minor color gradation did crop up while watching older content, such as The Fifth Element, but this was never noticeable enough to spoil the viewing experience. Blacks appeared much darker than most other LED LCD TVs on the market, thanks to the aforementioned Full Array Local Dimming technology behind the display. While the SK85's local dimming system exhibited far less blacklight bleed than we're used to seeing on LED LCD televisions, it never quite fooled us into thinking that we were looking at the perfect blacks of an OLED display — a quick boot up of Netflix revealed to us a backlight that was still visible in the black areas of the service's launch screen. That said, the SK85's black levels are extremely impressive for an LED TV. HD/SDR TL;DR: Newer HD content looks fantastic on the SK85 Super UHD, appearing vibrant, bright and high in detail. You may notice some minor instances of color gradation in older content, and its Full Array Local Dimming system doesn't quite reach OLED levels of pure blackness, but this is about as good as LED LCD gets. As expected, much of what we've discussed above in the HD/SDR section can be also applied to this 4K/HDR section, only the picture quality is even more exceptional when it comes to HDR and Dolby Vision material. A lot of this can be attributed to the SK85's nano-cell technology, which aims to provide a superior HDR picture by outputting narrower, high-density primary color wavelengths, which it's claimed improve both color accuracy and contrast. LG has employed nano cell technology in the past, but we're getting the second-generation version of the tech here, which the company says achieves 30% less ambient light reflectivity when compared the tech's previous iteration, and a 44% reduction compared to conventional LED TVs in general. We watched some content on the LG SK85 Super UHD during daytime hours with the curtains open, and while there was still light reflecting from the screen (which is unavoidable, really — even on the most expensive sets), it did seem less intense than some of the other TVs we've reviewed in the past 12 months. In terms of dedicated 4K HDR content, we kicked things of with a viewing of Christopher Nolan's space epic, Interstellar, and were floored with the results. Picture quality, particularly during the film's many full-frame IMAX sequences, was extraordinary, especially in well-lit scenes. During the film's space sequences, such as the moment in which the crew's shuttle passes through a blackhole, also impressed. As we mentioned in the section above, you might not be fooled into thinking that you're watching the infinite contrast of an OLED display, but the SK85 gets pretty darn close. The 4K Ultra HD Blu-ray version of Justice League also revealed exceptionally vibrant colors, with highlights, such as Wonder Woman's glowing lasso, and Cyborg's glowing red eye, piercing through the darkness with a burning intensity. We followed up Interstellar and Justice League with some HDR shows and movies on Netflix, including the food-centric Ugly Delicious, spectacular sci-fi series Lost in Space and the Dolby Vision-boasting Luke Cage. As expected, the LG SK85 delivered a high level of detail and color accuracy. We'd also like to point out that at no point did the LG SK85 Super UHD falter when it comes to image processing and motion. Regardless of which mode the television was in, it achieved smooth, consistent motion with absolutely no ghosting. 4K HDR Performance TL;DR: Fantastic color accuracy, exceptional brightness and consistent motion and image processing are just some of the SK85's most impressive feats. Black levels aren't quite as perfect as an OLED, but we're impressed by what LG has been able to achieve with LED LCD technology. For the purposes of our review, the LG SK85 Super UHD was connected to a SK9Y Dolby Atmos soundbar — although we did turn it off in order to get an idea of what the TV's own built-in speakers were capable of. Boasting 40W speakers with Dolby Atmos capability, the LG SK85 Super UHD's speakers did a pretty good job creating a three-dimensional surround soundscape. Clean and clear, the speakers delivered speech with terrific clarity and not a single hint of crackle. Where the SK85's sound performance falls a bit short is in the bass department. While not exactly weak or tinny sounding, the SK85 could stand to be a bit more powerful, giving you an aural experience that's about what you'd expect from in-built TV speakers. Unlike Samsung's 2018 Q9F QLED, you probably won't be fooled into thinking there's a hidden soundbar nearby. Sound TL;DR: Though perfectly capable when it comes to delivering sound, those looking for powerful, bass-filled audio will probably want to complement the television with a soundbar or hi-fi system. As Dolby Vision continues to gain traction with TV manufacturers, we're seeing more sets that are able to boast incredible color accuracy and brightness. Sony's X900F (XBR-65X900F) 4K TV is a fantastic alternative that provides excellent HDR picture and color vibrance. Though it doesn't have Dolby Vision support out of the box, it's been promised that a future update will bring the format to the X900F. Alternatively, while it's a bit more expensive, LG's own C8 OLED TV is a best-in-class product that features all of the AI ThinQ features included in the LG SK85 Super UHD, along with the infinite contrast and perfect blacks that OLED technology is known for. While OLED is generally considered the gold standard when it comes to TVs, the LG SK85 Super UHD shows that LED LCD technology still has plenty of tricks up its sleeve. Featuring impressive backlighting technology in full Array Local Dimming and the most cutting edge AI-assistant functionality currently available for televisions, LG's SK85 Super UHD TV is a terrific alternative to the company's more expensive OLED range.